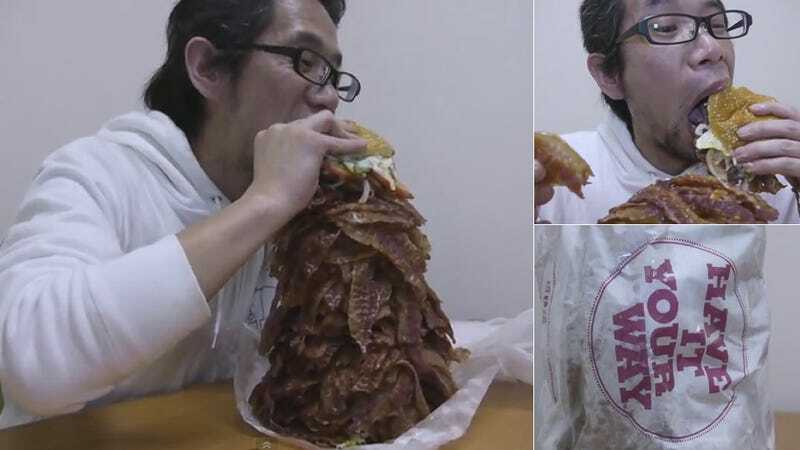 Burger King Japan is going bonkers with bacon. For a mere ¥100 (US$1.24), you can, as sister site Gawker pointed out, add 15 slices of bacon to your Whopper. But why stop at 15? Japanese website RocketNews sure didn't. It added 1,050 strips of bacon to a whopper. Over one thousand! In bacon math, that's ¥7,000—or $86.85. In this video, RocketNews unwraps the bacon Whopper and just kind of looks at it before actually trying unsuccessfully to polish some of it down. Sometimes having it your way also means having to barf up bacon.